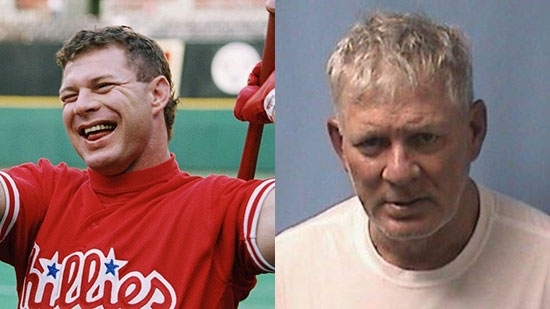 Former Philadelphia Phillies center fielder Lenny Dykstra was arrested early Wednesday morning, 5/23, in North Jersey after threatening an Uber driver. 55-year-old Dykstra was picked up by the 47-year-old driver in Linden, NJ, where he lives, at around 3:30 a.m. Once inside the car, Dykstra requested a change in the predetermined destination, but the driver denied his request. That's when the former All-Star player pulled out a weapon and threatened to kill the driver. The driver drove to the nearby Linden police station and repeatedly honked his horn outside to get officers' attention. He then exited the vehicle and left Dykstra inside. Police couldn't find a weapon but did find Dykstra in possession of cocaine, marijuana, and ecstasy. He was charged with making terroristic threats and drug possession. He was released on his own recognizance and is due back in court on June 8th. Dykstra is no stranger to the law and has a long rap sheet of offenses. He spent 6 ½ months in a federal penitentiary in 2013 on charges of grand theft auto and filing a false financial statement. He was a member of the 1986 New York Mets World Series team and 1993 Philadelphia Phillies National League team. *not to be confused with former WWE wrestler Kenny Dykstra. Philadelphia Police are looking for the suspect and victims in a road rage incident caught on surveillance video in a Port Richmond parking lot on Tuesday, 5/22. It happened around 1:30 p.m. on the 2700 block of East Luzerne Street. The video shows a silver SUV enter the lot followed by a red pickup which then blocks in the SUV. A man gets out of the red truck and starts to hit the driver's side of the SUV with a sledge hammer smashing the glass and denting the door. The passenger of the SUV tries to get out of that vehicle, but the driver starts to pull away and he ends up falling out. The passenger then limps back to the SUV across the lot and the man with the sledgehammer swings and hits him. The SUV managed to turn around and the passenger gets back in and they drive away. Police are looking for any information on the suspect or the victims who have not come forward. Anyone with any information is asked to call police at 215-686-TIPS. A Philadelphia charter school staff member has been suspended indefinitely after bringing an unloaded gun to school. It happened on Wednesday morning, 5/23, at Russell Byers Charter School on 19th and Arch Streets in Center City. Students saw the weapon and then notified a school counselor. Principal Kareem Goodwin says that the police were called who then escorted the unnamed staffer from the building for questioning. No arrests have been made but the incident is still under investigation. NFL Commissioner Roger Goodell announced a new policy approved by NFL owners surrounding the National Anthem. Under the new rules all players and league personnel on the field during the "The Star-Spangled Banner" must stand and 'show respect for the flag and the Anthem.' However, players are not required to be on the field during that time and may choose to stay in the locker room. If someone violates that policy, the team will be fined, not the individual player or staff member.